Fixed price guarantee for 18 months. Totally unlimited Internet usage with online security features. Powerful Wifi Hub (free postage and packaging). Access to TalkTalk TV Store Inc.
TalkTalk TV box - pause & rewind live TV. Add & remove channels, inc. Sky Sports & Sky Cinema, on a flexible 1 month contract. Access Netflix straight from your TV, from £5.99 a month with Netflix subscription. £0 TV box cost. Fixed price guarantee for 18 months. Totally unlimited Internet usage with online security features. Powerful Wifi Hub. Access to TalkTalk TV Store Inc.
1Mb average upload speed. £0 TV box cost. Fixed price guarantee for 12 months. Totally unlimited Internet usage with online security features. 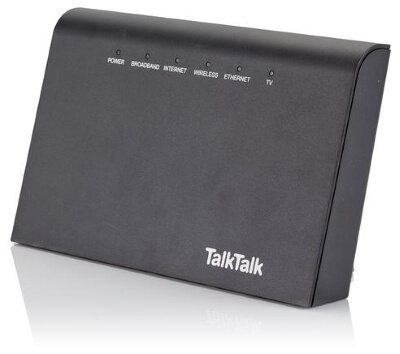 Powerful Super Router (free postage and packaging) Access to TalkTalk TV Store Inc.
£50 TV box cost. Fixed price guarantee for 18 months. Totally unlimited Internet usage with online security features. Powerful Wifi Hub. Access to TalkTalk TV Store Inc.
1Mb average upload speed. £50 TV box cost. Fixed price guarantee for 12 months. Totally unlimited Internet usage with online security features. Powerful Super Router (free postage and packaging) Access to TalkTalk TV Store Inc.
TalkTalk began life as a subsidiary of Carphone Warehouse, after the firm purchased Opal Telecom in 2002. Although initially launched in 2004, TalkTalk really hit the big time in 2006 with its famous free broadband offer, which promised free broadband for life. It expanded quickly and acquired several other ISPs to extend its network and user base, including Tiscali and AOL. In 2010 TalkTalk split from Carphone Warehouse, and it’s now one of the most popular ISPs in the UK with more than 3.9 million subscribers. In the early days TalkTalk offered broadband up to 8Mb, along with a dial-up service for those without broadband access. It has since upgraded its network to provide ADSL broadband with an average speed of 11Mb and fibre broadband at 35Mb or 63Mb (the obsolete dial-up service was discontinued several years ago, though it did well to hang on until 2013!). In addition to fixed line broadband TalkTalk also offers its own TV service thanks to a partnership with YouView, alongside cut-price mobile phone packages with free SIMs for every customer. Extras can be purchased alongside the broadband and phone, making it one of the cheapest “quad play” providers around. As with most ISPs, TalkTalk broadband uses the BT Openreach network to power its services. So while TalkTalk is responsible for billing and support, BT Openreach maintains the lines and it’s a BT Openreach engineer who will be sent out to setup the broadband (and fix it if things go wrong). Read more about installation in our handy guide to TalkTalk installation times. If you’re after the cheapest broadband service, ADSL is the way to go, and it’s what you’ll get if you opt for any of the TalkTalk Fast Broadband deals. It uses the telephone lines to provide an average 11Mb download and up to 1Mb upload. Not the quickest around, but still capable of handling more intensive tasks such as HD video streaming and file transfers, as well as regular web browsing and email. However, if you demand more speed or the connection is going to be shared with housemates or family, then it may be worth upgrading to superfast fibre optic. Fibre optic broadband offers much better speeds than ADSL yet prices remain affordable and TalkTalk Faster Broadband deals with fibre optic are still great value. TalkTalk fibre is available with download speeds averaging 35Mb or 63Mb, and upload speeds up to 2Mb or 20Mb. This makes it ideal for shared homes, or just anyone who wants to quickly download large files or stream very high definition content. 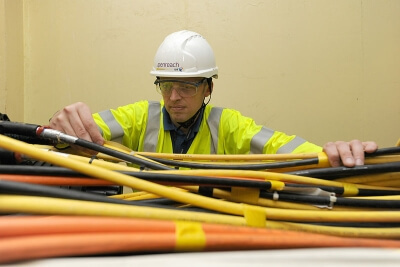 TalkTalk fibre uses a technology known as Fibre To The Cabinet (FTTC), where those ultrafast fibre lines run to the street cabinets and the connection into homes is completed with the regular phone line. This has several advantages: it’s available to more than 80% of premises and is quick and cheap to install. While an engineer visit is required to perform the initial setup and test the line, there’s no need to dig anything up or drill lots of holes in the wall, provided you already have a BT network phone line coming into your property. All TalkTalk packages include a free TalkTalk router which offers wired and wireless networking for sharing files and easily connecting all your Wi-Fi devices around the home. In order to use TalkTalk broadband you must have also have an active telephone line so - in common with most other ISPs - they do not offer broadband without a phone line. However, all TalkTalk broadband deals include a phone line and the prices you see on our comparison tables is the total cost for both broadband and phone. Not all TalkTalk phone and broadband packages come with inclusive calls though. If you never use the landline for calling and only have it around for broadband, you don’t need to pay any extra beyond the line rental. Just keep in mind that with these basic packages any calls will be charged at TalkTalk’s standard per-minute rate. If you do like to chat, TalkTalk has the following call boosts. These add-ons are not expensive, and can save a great deal of money, particularly for international calling. Unlimited UK Calls: unlimited calls to UK landlines and mobiles at any time. £7.50 per month. International Saver: discounted calling rates to international numbers. No limit on usage. £2.50 per month. International Extra: 1000 inclusive minutes to landlines in 50 countries, and discounted rates on all other calls. £5 per month. International Max: 1000 inclusive minutes to landlines and mobiles in 50 countries, plus discount rates on all other calls. £10 per month. TalkTalk call boosts can be added to or removed from your package at any time without any penalty, and can be managed through your account controls on the TalkTalk web site. In addition to broadband only deals, TalkTalk also offers TV and broadband bundles. TalkTalk TV includes a YouView box with smart features and integrated on-demand and catch-up players, plus the option to extend beyond the standard Freeview line-up with premium content such as Sky Movies, Sky Sports and popular entertainment channels. The basic TalkTalk TV package is free, while TalkTalk TV Plus requires an additional fee but gives you over 30 popular channels and a YouView box with recording. On our home broadband comparison tables you’ll find a postcode checker field. Enter your address and deals will be filtered by location. This is important because not everyone has the same choice of broadband packages. While TalkTalk broadband deals are available to the vast majority of homes and businesses, the type of broadband and speed will vary depending on location. Some areas may have a wide variety, but in other places (especially rural areas) the selection can be more limited. This is often the case with fibre optic broadband which is not as widespread as ADSL connectivity. Unfortunately if fibre is not installed in your area the only option may be an ADSL service, however upgrades are ongoing so it’s worth checking back regularly. For more help on this topic, including guides for specific towns and cities, visit our local broadband hub. Once you’ve checked availability use the filtering and sorting tools on the comparison to search the options and find your ideal package. If at any point you get stuck or want further assistance, check out our features and home broadband guides. The speed of your broadband package will depend on the services available at the exchange, how far you are from the exchange and the condition of your lines. Speeds can also fluctuate at peak times as more people are using the network. Your broadband speed can be expected to provide an average 11Mb download for ADSL, and 35Mb or 63Mb with fibre optic. When joining TalkTalk you will be given an accurate speed estimate, so you’ll have an idea of what to expect before paying anything. All TalkTalk broadband deals are totally unlimited. In the past TalkTalk did offer packages with monthly data usage limits, but these have been retired and everybody signing up now gets unlimited access. You can download and upload as much as you like without worrying about penalties. TalkTalk broadband is also free of restrictive traffic management. Some ISPs may slow down particular activities at peak times to ensure stable performance for the majority of users, but TalkTalk has no such policy. The only traffic management measures it implements are used to prioritise TV streaming to minimise buffering and loading times. Broadband bargain hunters are going to be drawn to TalkTalk’s very low prices. Its TV, broadband and phone deals are especially alluring. TalkTalk also promises not to increase prices mid-contract, so the cost will remain the same for up to 18 months. And all its broadband services are totally unlimited, plus you get some nice extras. But TalkTalk does suffer from a poor reputation when it comes to customer service. It has made efforts to improve matters, but continues to be rated poorly in the Ofcom customer satisfaction report. However TalkTalk is making changes, including the closure of a controversial Indian call centre, new online repair tools and the ability to avoid call waiting times by sending messages through the MyTalkTalk app.